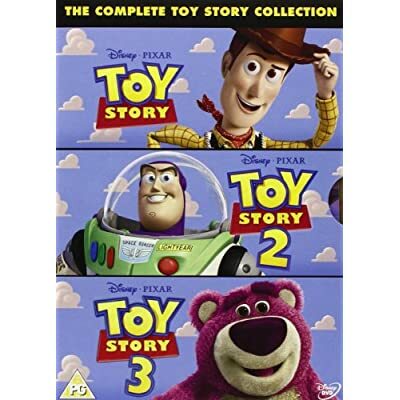 Toy Story: Before Finding Nemo, Monsters, Inc. and Cars, the creative minds of Disney/Pixar invited you into an astonishing world where toys happily play while their owners are away. Enjoy all the fun and excitement with Woody, Buzz Lightyear and all their friends in a movie that goes to infinity and beyond! New! Sneak Peek "The Story"
Toy Story 2: Experience the groundbreaking computer-generated hit that earned a Golden Globe Award for Best Picture. Rediscover the humour and heart of this hilarious family film, and join Woody and Buzz as they meet some wonderful new friends on the adventure of a lifetime! New! Sneak Peek "The Characters"
Toy Story 3: The creators of Disney/Pixar's celebrated Toy Story films reopen the toy box and invite you back inside a magical world for a story you'll never forget. Take an amazing journey with some of the most beloved characters in movie history and discover what being a friend is truly all about.